Sentinel node biopsy is a technique which helps determine if a cancer has spread (metastasized), or is contained locally. When a cancer has been detected, often the next step is to find the lymph node closest to the tumor site and retrieve it for analysis. 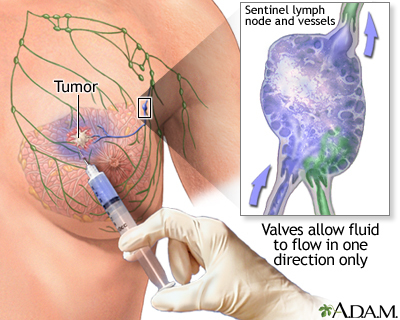 The concept of the "sentinel" node, or the first node to drain the area of the cancer, allows a more accurate staging of the cancer, and leaves unaffected nodes behind to continue the important job of draining fluids. The procedure involves the injection of a dye (sometimes mildly radioactive) to pinpoint the lymph node which is closest to the cancer site. Sentinel node biopsy is used to stage many kinds of cancer, including lung and skin (melanoma).